In a survey conducted by Accenture, 66% of people said they quit doing business with a company because of a negative experience. Customer service is a key competitive differentiator. No business can afford to deliver anything less than an exceptional customer experience (CX). 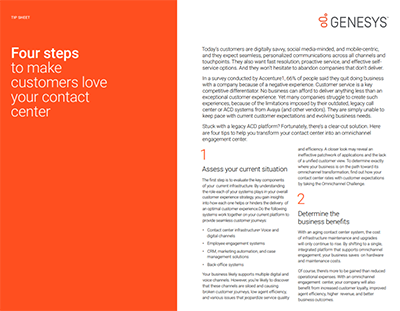 An omnichannel engagement center solution offers business benefits such as lower costs and higher revenue—plus CX advantages such as shorter hold times, slashed abandonment rates, and a better Net Promoter Score.